charter "died" 10/04/1834, note 1941-149; 1941-137. Petition for Restoration of Charter: 1803 "Petition to assemble again as a lodge; granted, charter endorsed." By Right Worshipful Wlllard S. Little. And, lo! are gone; we know not where! Honoured Brethren of the early years." It is eminently fitting that the members of St. John's Lodge, A.F.& A.M., who this day celebrate the 175th anniversary of the Lodge, should, on the occasion cast a backward glance to its history and render an account of its achievements. Having been entrusted with the elaboration of this work, I will to the best of my ability discharge the duty assigned to me. One hundred and seventy-five years with their varied experiences have come and gone since the founding of St. John's Lodge. All who were here at the beginning have long since gone to "that undiscovered country from whose bourne no traveler returns," but their work survives. As their successors, it is our privilege to witness the fulfillment of their hopes and rejoice with grateful hearts that St. John's Lodge, at the end of one hundred and seventy-five years, stands as an honor to her founders. So today we pay our respects to a little band of good men and true, far back in the early dawn of our country's existence who were inspired to establish a beacon light of Masonry in the community. The career of this Lodge has been an honorable one although not a smooth one. It requires the pen of a historian to recount adequately the service which St. John's Lodge has rendered to this city, state and country. Newburyport is rich in Masonic history. Let us for a moment pay our respects to St. Peter's Lodge, founded in 1772, to King Cyrus Chapter of Royal Arch Masons, the second Chapter in Massachusetts, founded in 1790, to the Newburyport Com-mandery of Knights Templar, founded in 1795, which was the first Commandery organized in America, and to our sister Lodge, St. Mark's, chartered in 1803. I doubt if there is a city or town which can present such a Masonic record. Of the beginnings of St. John's Lodge there is little that is of record. The early Lodges were careless about the keeping of records. Even the premier Grand Lodge of the Western Hemisphere organized in Boston, Massachusetts, July 30, 1733, has no formal and continuous records written in a book until 1750. Our Charter, granted by Jeremy Gridley, Grand Master of Masons in North America, on July 17, 1766, does not give any name to the Lodge, but appoints our "Right Worshipful and well-beloved Brother Stephen Hooper to be the first Master of the lodge at Newburyport aforesaid and do hereby empower him to congregate the Brethren together and form them into a regular Lodge, he taking special care in choosing two wardens and other officers necessary for the due regulation." The Deputation for our new Grand Master being Arrived, I would inform you that the Grand Lodge have appointed Wednesday the 23rd day of November next for the Installment, and directed me to write to all the Lodges in New England, to desire their Attendance at said Ceremony, and to bring their Jewels and Clothing with them. Wherefore in obedience to their Commands, I do invite You, and the Officers and Brethren of the Lodge at Newburyport to attend as aforesaid, and do request you to Write me what number of Brethren from your lodge may probably attend, that Provision may be made accordingly. "P.S. I also recommend Bro'r John Emery to represent the Secretary Pro. Temp'r." On November 23, 1768, the Master and Wardens named in Brother Hooper's letter took part in the installation of Right Worshipful John Rowe as Grand Master. There also attended Brothers Bulkeley Emerson, Moses Parsons, Moses Titcomb and the Rev. Edward Bass. Masons are hereby notified that the R. W. Stephen Hooper, Esq. intends to celebrate the feast of St. John, the Evangelist, on Tues. the 27th of December at Mason's Hall in Newburyport. All brethren are desired to attend at eleven o'clock A.M.
Dinner precisely at two o'clock. The issue of December 15, 1775, of the same paper carried a notice for the Brethren to assemble on December 27th at Messrs. Davenport's at the sign of General Wolf by order of R. W. Stephen Hooper for the celebration of the Feast of St. John, the Evangelist and was signed by Bulkeley Emerson as Secretary. "To celebrate the feast of St. John the Evangelist." The names of the Tylers are rather odd for their particular offices — Friend and Kindness — yet it may be that they were friendly and kind to visitors. There were 31 members and three visiting Brethren present at this meeting. A study of the records show that during this period there were approximately 90 members. There is no record where the early petitioners for the Charter were made Masons. It is quite probable that all being merchants, army officers and captains, that they were raised in Boston or Marblehead. The early By-Laws provided for "the annual meeting to be held on the feast of St. John the Evangelist and the officers chosen before twelve o'clock A. M.; every person made a mason shall pay the treasurer for use of the lodge three pounds plus three shillings to the tylers; every brother made a member shall pay twenty-eight shillings; every member shall pay one shilling and four pence every month for the benefit of masonry and one shilling four pence every regular lodge night he is present for expenses; every visiting brother (after the first visit) shall pay three shillings towards the expenses of the lodge; every member shall attend the meeting of the Lodge on regular and general lodges at least once in three months if within the State, and in default thereof shall be summoned before the lodge where in case of obstinate disobedience to the precept of the lodge or on failure of giving to the lodge satisfactory reasons for such absence, such member shall be expelled from the Lodge as an unworthy Brother; no member of this Lodge shall profanely curse or swear in the Lodge or hold any private council or conversation or absent himself from the lodge whilst the Lodge is open, without leave obtained from the Master under the forfeiture of three shillings for each and every such offense; whenever a special lodge is convened he or they at whose instance the meeting is called shall pay all the expenses; every person proposed and every man made a member shall be vouched for by some member present and if the person made a brother or member does not pay the sums for their making at the same meeting, the sums shall become the debt of the voucher and he shall be held icr the same." Stephen Hooper was born the son of Robert Hooper of Marble-iead on July 3, 1741. He graduated from Harvard in 1761. His father was called "King" Hooper and was one of the wealthiest merchants of New England. Stephen operated a mill at the amctith of the Artichoke River, had a shipping business on the wharf above Green Street and resided on the south side of Frog Fbnd. He died Jan. 16, 1802. Hooper was Master 1766-80 and 1786-1802. Nathaniel Tracy was without doubt the most prominent of far early Brethren. In a memorial presented to Congress in 1106, ten years after his death, it was claimed that from the beginning of the Revolutionary War until peace was declared in 1713, he was the principal owner of 110 merchant vessels, which with their cargoes, were valued at $2,733,300. All but 13 were lost or captured. He also owned 24 cruising ships carrying 340 and 2800 men. These ships captured 120 vessels carrying 2225 men. The captured vessels and cargoes were sold for $3,950,000. From the sum, Brother Tracy contributed $167,219 for army supplies. He was Selectman of the town 1780 and 1782 and Representative to the General Court in 1782. He was Master of St. John's Lodge 1781 and 1782. He lived in the building now used as the Public Library. John Tracy, Worshipful Master during 1783-85, a brother of Nathaniel, gave a considerable sum to clothe the Continental Army. He resided on High Street, saw service in the army, lost 41 vessels during the war and was a successful merchant. Michael Hodge was a captain of the Newburyport Artillery Company and was Collector of Customs of the Port from 1766-84. Colonel Edward Wigglesworth, the Junior Warden, served with great distinction in the army. He was with Washington at Boston, New York and Valley Forge, and when retired, he was given thanks by Washington. He was a Representative from 1792 to 1795. Laurence Furlong was author of the American Coast Pilot. Nathaniel Knapp was Overseer of the poor for many years. He was a man of good sense, honest and upright. He fought in the French and Indian War and the iron shell which now reposes in front of the Court House on the Mall was brought from the siege of Louisburg by Brother David Coates in memory of Brother Knapp. Nicholas Johnson is claimed to have been the first to unfurl the Stars and Stripes on the River Thames. Rufus King, Representative to the General Court, member of the Continental Congress, and four times Senator from New York, was twice United States Minister to the Court of St. James. Yet on Dec. 27, 1783, he was fined three shillings for leaving the lodge-room without permission of the Master. Capt. Moses Brown spent 46 years on the seas, commanding merchant vessels, privateers and the warship (so-called) Merrimac, built at Newburyport and loaned to the U. S. Government. Dudley Atkins was a very able lawyer, orator and reporter for decisions of the U. S. Supreme Court. Eleazer Johnson, Captain of one of Stephen Hooper's vessels, the Dalton, was captured by the British and, with Brothers Henry Lunt and Samuel Cutler, was lodged in Mill Prison at Plymouth, from which they all escaped. Jonathan Titcomb was a Brigadier General. He fought in the Revolution, was a member of the first General Court, and a member of the State Convention for forming the State Constitution, with Brother Rufus King. Right Reverend Edward Bass, D.D., although not a member of St. John's Lodge, was an ardent Mason and visited St. Peter's and St. John's Lodges many times. I call attention to Brother Bass because of his close association with the Brethren. The records of both Lodges speak in glowing terms of his excellent addresses delivered to the Brethren on the occasions of celebrating a feast day. He was rector of Queen Anne Chapel and St. Paul's Church from April 2, 1756, to Sept. 10, 1803. He was ordained the first Bishop of the Diocese of Massachusetts, New Hampshire and Rhode Island on May 7, 1797, in Philadelphia. In 1916 Brother Horace I. Bartlett compiled a history of this Lodge and gave a very excellent account of many more of the members. I make mention of only a few in order that you may note that there was hardly one man whose name appears during tie earlier period but who was prominent in the affairs of the colonies. MARCH 27, 1782 "Voted that the stewards be and hereby are desired to procure seme wine glasses and candlesticks such as they shall think suitable for the Lodge. Also to have the Tables mended." DECEMBER 23, 1782 "Voted that Bro. Perkins is guilty of a breach of the 11th Article of the Laws for leaving the Lodge whilst open, without Leave having been obtained from the Master, and that he be fined 3 shillings." At every meeting a collection for distressed Brethren was made and a committee appointed to disburse it. There was always a committee appointed to serve as caterers and they were thanked for the very excellent repast. The celebrations of the Feast of St. John the Evangelist in December and St. John the Baptist in June were always marked with a banquet and an address. The speaker was either Rev. Edw. Bass, Daniel Marquand or Dudley Atkins. The Lodge usually assembled at Thomas Merrill's or William Davenport's. On Dec. 27, 1784, it was voted to give up Mason's Hall and meet at Thomas Merrill's, then on October 5, 1785, it was voted to remove the Lodge to Wm. Davenport's house till a more convenient room could be obtained. On Oct. 4, 1785, the Lodge met with St. Peter's Lodge to attend the funeral of deceased Brother Jos. A. Davis, Tyler of St. Peter's. In 1785, "on motion of Bulkeley Emerson and seconded by Bro. Dudley Atkins that from the scarcity of money and the very considerable sums now in arrears from the members of this Lodge, it was voted that each member be earnestly requested to pay one quarter part of his past dues (exclusive of sums due for making) as soon as maybe which shall be in full discharge for the same and that in the future there shall be a quarterly payment of ten shillings to the fund by each member and that the expense of every evening shall be equally assessed on the members who shall be present and to be paid before the lodge is closed." In 1788 "on returning from a funeral the Brethren of St. Peter's and St. John's Lodges returned by invitation of our Master to St. John's Lodge rooms where the most dissembled harmony and friendship pervaded the whole and Masonry shone in full favor." "It is needless to go particularly into the History of Masonry on this occasion. We know that the principles of the Craft are coeval with the Creation of our Species. That they have passed through successive ages and through various nations of the Earth. From East to West and between the North and the South, confined to no climate, language, religion or government. That they have been at some periods more extended and some less; and this in a degree proportionate to the several stages of the rise and declination of learning and arts, freedom, and Religion in the world and in particular nations. "I cannot help suggesting that in times when we find disinterest and uneasiness abroad, we are peculiarly urged by the highest motives of duty and interest to a frequent attendance on our regular communications. Little necessity should there be, we think, of pressing this duty upon worthy Masons at such a time, when all is jarring and discordant without, the Lodge affords us a happy and welcome retreat." It is rather interesting to note how appropriate these words of Brother Atkins, spoken in 1786, would be for an address this evening. "A petition was presented from Michael Hodge and others in Newburyport, surviving officers of St. John's Lodge, chartered by the late M.W. John Rowe, Grand Master, that they may be admitted to assemble as a lodge and promising due submission to the laws and regulations of the Grand Lodge. It was committed to the R.W. Bell, Oliver and Howard, who reported in favor of their admission, also, that their charter should be en- dorsed and the Lodge take rank from the time of its endorsement." On Sept. 10, 1804, in the list of Lodges published by rank, St. John's of Newburyport "July 17, 5766," is fourth on the list. On March 30, 1803, a meeting was held at the lodge-rooms with Michael Hodge, Acting Master. There were 10 Brethren present and they admitted 10 Brethren as members, remitted all dues owed up to that time and elected officers, with Gilman White as Master. The officers were installed by Jonathan Gage, District Deputy Grand Master. They voted "all who were members previous to the endorsement by the present Grand Lodge be solicited to attend the future meetings of this Lodge as honorary members free of dues." For the next five years St. John's Lodge prospered; then came the embargo act which forbade our vessels visiting foreign ports, resulting in the shipping industry practically shutting down. This was followed by the great fire of 1811 and the War of 1812. On Nov. 15, 1803, I note for the first time members of St. Mark's Lodge visited St. John's. St. Mark's Charter was granted Sept. 14, 1803. On Nov. 30, 1803, the first communication from the Grand Lodge appears copied in the records, regarding the expulsion of two members of Republican Lodge in Greenfield; also a notice from John Proctor, Grand Secretary, stating that "the seals of lodges must be affixed to appointments of Proxies in the future." On March 21, 1804, it was voted "that the tylers of St. Peter's and St. Mark's Lodges for the time being be allowed to visit this lodge free of dues." May 16, 1804, the Lodge voted "that no notice be taken of the communication presented this evening from St. Peter's Lodge concurring that, that Lodges have no right to dictate to them who they shall receive as visitors." At a meeting later in the month it was voted not to celebrate the "festival of St. John as it would conflict with the constitution of St. Mark's Lodge." On Dec. 5, 1816, the District Deputy made his annual visitation to all three Lodges the same night. New By-Laws were adopted on April 24, 1815, "where every member was to pay twenty cents present or absent at every communication except those at sea who were to pay ten cents and visitors twenty-five." To carry on through the years up to 1916 would be only a repetition of the excellent history prepared by Worshipful Brother Horace I. Bartlett for the 150th anniversary, so I will note those happenings which I consider important. During 1823 there was a movement to unite the three Lodges but it was voted down by all three. On March 17, 1825, Caleb Putnam was made a Mason and with this notation: "This petition has been on file many months and it is clearly understood he is to pay his initiation fees by serving as tyler of St. John's Lodge, the present incumbent resigning." Sept., 1825, brought the appointment of three Brethren to investigate all future applicants. Beginning about 1828 there followed a rough course for Masonry and on October 4, 1834, the Lodge voted to return its Charter to Grand Lodge and that the Secretary be requested to forward and secure a receipt for the same. Until December 14, 1853, St. John's Lodge was non-existent and held no meetings. On the above date, upon petition of Richard S. Spofford and others, the Grand Lodge ordered the restoration of the Charter and on December 22, 1853, the organization was completed at the home of Worshipful Brother Spofford. From 1854 until 1909 the following notation is carried on each meeting record: "opened in the name of God and Holy St. John." At the same meeting it was voted "that a committee of tiree be chosen to investigate how and which way and by whom vis two quarts of oil obtained and charged to the Lodge." October 17, 1861: "No work on hand, being a war among ourselves (U.S.A.) the lodge closed as usual." On January 9, 1873, three brothers from England who were shipwrecked on the steamship Sir Francis off Salisbury Beach "who were saved from a watery grave by that Supreme Being who is the Great Architect of all things" visited the Lodge. On February 3, 1873, an application was received from Charles Wallis Dame which was accepted and filed. He is present tonight, our oldest Right Worshipful and member. On February 7, 1884, the Permanent Fund was started. On May 19, 1891, three Brothers were raised, Worshipful Horace I. Bartlett, Brother George W. Brown and Brother Ralph E. E. Beatley. In 1895 the Lodge started the election of all officers by ballot. It is interesting to note that our Secretary, Worshipful Brother Herbert W. Fogg, raised his father to the sublime degree on May 6, 1901. On September 28, 1903, the Lodge attended the 100th anniversary of St. Mark's Lodge. On September 15, 1912, a committee was appointed to arrange for the 150th anniversary to be held in 1916 and Worshipful Brother Bartlett was instructed to prepare a history. June 6, 1916, Brother Capt. Thomas J. Maddock witnessed the raising of three of his five sons, the other two being made on other dates. July 16-17-18, 1916, the Lodge celebrated its 150th anniversary. On Sunday, July 10th, the Lodge attended divine worship at the Old South Church. The sermon was delivered by Rev. William H. Rider, D.D., of Essex, an Honorary Member of St. John's Lodge. On Monday, July 17th, the Lodge was opened at 2 o'clock, P.M., a procession was formed, and headed by Most Worshipful Brother Melvin M. Johnson and other Grand Lodge officers, marched to the Old South Church where an eloquent address on the Philosophy of Masonry was delivered by Brother Johnson. Worshipful Brother H. I. Bartlett gave a historical talk on St. John's Lodge. In the evening a banquet was held at City Hall, with Worshipful Brother Oscar Nelson presiding. Members of St. Mark's Lodge were guests for the evening. Most Worshipful Brother Johnson presented seven Henry Price medals during the evening to 50 year members. On Tuesday evening, June 18, a ladies' night for members of St. John's Lodge was held at City Hall, a celebration long to be remembered by those present. During the next few years St. John's Lodge had a period of prosperity due to the World War. Many applications were received and members raised. St. John's Lodge had 30 members in the service, whose names appear on a roll of honor in our records. Many emergency rules and regulations were placed in effect, for example, electric lights were discontinued after 10 o'clock P.M. unless for an emergency. Meetings were curtailed during February and March, 1919, due to an epidemic of influenza. Examples of the amount of work the Lodge was confronted with are the following notations: 8 applications, 7 elected, 3 passed and 5 entered on one night 8 elected, 12 applications, 5 entered; on another night 10 elected, 1 rejected, 5 entered and 5 passed was one evening's work. In 1920, 44 initiated, 41 passed, 49 raised and 17 rejected. During the period to May, 1927, the records are in a way monotonous; the Lodge showed continued prosperity and on May 5, 1927, a committee was appointed to act with St. Mark's and the Temple Club for the purpose of considering the formation of a Masonic Building Association. On Sept. 1, 1927, the committee reported that it was in favor or" a building association. On the same evening a joint meeting wis held with St. Mark's Lodge. Worshipful Brother Genn occupied the East with Worshipful Brother Little. As a result at this meeting, it was voted to start a campaign to raise funds for a Masonic Temple. The campaign was carried out and work sorted on the Temple. During the terms of office of Worshipful Brother Albert Genn in St. Mark's and Worshipful Brother Willard S. Little of St. Jean's, the practice of interchanging officers was started, and it met with success and approval by the Brethren. Also during rilBs period these two Brethren started the collection of pictures of the Past Masters of both Lodges. It was an arduous task but great success was achieved. It is also interesting to note that Brothers Genn and Little were elected Marshals of their respective Lodges in 1929 and have been continued in office up to the present time. June 20, 1928, brought forth the ceremonies of laying the cornerstone of the new Temple located on Green Street. The Lodge was opened at 1:30 P.M., and with St. Mark's Lodge and Right Worshipful Otis C. White, Deputy Grand Master and Acting Grand Master, and other Grand Lodge officers, formed a procession and marched to the site of the Temple. The cornerstone ceremonies were carried out by the Acting Grand Master and other officers in excellent form. The silver trowel used to lay the corner-stone was presented to the Lodge by 32 Brethren employees of the Towle Mfg. Co. The names of the Brethren are carried on the records and the trowel is in the ante-room of the Lodge. The list of records which were placed in a metal box and inserted in the corner-stone are also listed on the lodge records. The ceremonies were carried out in a driving northeast rain and a canopy was provided for the officers. Many citizens, including Mayor Andrew J. Gillis, witnessed the ceremonies. The dedication of the Masonic Temple was held on March 27, 1929. The ceremonies included the opening of both St. Mark's and St. John's Lodges, a reception to Most Worshipful Brother Herbert W. Dean, Grand Master, and other officers of the Grand Lodge, followed by a banquet in the large banquet hall. Brother Charles F. A. Hall presided as master of ceremonies. Most Worshipful Dudley Hays Ferrell, Past Grand Master, delivered a stirring address. Following the banquet, the Brethren proceeded to the lodge-room where the Temple was dedicated in ancient form by Most Worshipful Brother Dean and other Grand Lodge officers. Following the ritualistic work, Most Worshipful Brother Dean made an interesting and practical address. There were 23 Brethren on the Grand Master's suite and 543 Brethren sat down to the banquet table. The spacious lodge-room was filled and only sufficient floor space was left for the carrying out of the ceremonies. It was an evening and event long to be remembered by the Brethren of Newburyport. Since 1929, the Lodge has carried on with competent officers, and although prosperity does not exist as in other years, no cloud appears in sight before her. Let us remember that we are heirs of the past. We have received from those who have lived before us a magnificent contribution. We are receiving for our inspiration great history and great events that are very thrilling. But if we are to continue the torch burning brightly and to light the path as it has in the past, we must pay strict adherence to our precepts and stake certain that the light does not diminish as we hand the torch over to those who follow after. I believe at this time attention should be called to the length Cl" service given by several of our Brethren in St. John's Lodge. Worshipful Moses Fowler was Treasurer for 21 years. Worshipful Frank Rundless was Tyler from Mar. 28, 1895, ~ Aug. 5, 1923. Brother Samuel Brookings, 36 years as Secretary, 1873-1909. On his first return there were 67 members and on his last, 265. Rev. T. James McFaddin was Chaplain for 28 years. Brother A. G. Perkins was Marshal for 16 years. Right Worshipful William C. Coffin was Secretary for 21 years. His records are a work of art, complete in every detail and a monument to him. Brother Arthur P. Marden was elected March 6, 1902, and is sell waving his musical baton over the Lodge. "But let us see to it that St. John's future shall be more glorifies than its past. It has stood as a monument of our order for mere than a century and brethren with all the hallowed associations which cluster around it, let it be our endeavor so to watch over the prosperity that when another century shall have rolled away those who shall come after may say of us, that we were not unworthy sons of the founders of Old Saint John's." By Worshipful William F. Mahoney. Having been assigned the duty of bringing the history and achievements of Saint John's Lodge up to date, I will, to the best of my ability, perform the duty entrusted to me. As we celebrate this 200th anniversary, we should pay homage to a band of good men that had been found free-born, of good report, and well recommended. Their names will appear in this history from time to time, and the memory of them will never, never die, for it is entered on the records of this Lodge. Far back in the early dawn of our country's existence these men, good and true, established a great light in the community known as Masonry. Saint John's Lodge has had an honorable career and, at times, not a smooth one. R.W. Willard S. Little once stated "It would require the pen of an historian to recount adequately the service which Saint John's Lodge has rendered to this city, state and country". Newburyport has a rich Masonic history. We should at this time pay our respects to St. Peter's Lodge founded in 1772, to King Cyrus Chapter of Royal Arch Masons founded in 1790, the second Chapter in Massachusetts, to Newburyport Commandery of Knights Templar founded in 1795 and the first commandery in America, to St. Mark's Lodge founded in 1803 and Emeth Lodge chartered in 1955. The early Lodges were careless in the keeping of records and therefore the beginning of St. John's has very little to record. Even the Premier Grand Lodge of the Western Hemisphere organized in Boston, Mass., July 30, 1733 has no formal and continuous records written in a book until 1750. The charter of St. John's Lodge was granted by Jeremy Gridley, Grand Master of Masons in North America, on July 17. 1766. It does not give a name to the Lodge but appoints our "Right Worshipful and well-beloved Brother Stephen Hooper to be the first Master of the Lodge at Newburyport aforesaid and do hereby empower him to congregate the Brethren together and form them into a regular Lodge, he taking special care in choosing two wardens and other officers necessary for the due regulation"
It would seem proper to assume that meetings were held prior to the year 1766 without benefit of a charter; therefore, we must record the records as from the date of charter. The research conducted by our late R. W. Willard Stone Little being so thorough and complete, I feel that I could not improve upon the same, and therefore, for the benefit of those who have become members of this Lodge since the 150th anniversary, I shall repeat his findings. The Deputation for our new Grand Master being arrived, I would inform you that the Grand Lodge have appointed Wednesday the 23rd day of November next for the Installment and directed me to write to all the Lodges in New England, to desire their Attendance at said Ceremony, and to bring their Jewels and Clothing with them. Wherefore in obedience to their Commands, I do invite You, and the Officers and Brethren of the Lodge at Newburyport to attend as aforesaid, and do request you to Write me what number of Brethren from your lodge may probably attend, that Provision may be made accordingly. Your Affectionate Friend and Brother Stephen Hooper. Another letter dated November 21, 1768 to Brother Savage. P.S. I also recommend Bro'r John Emery to represent the Secretary Pro. Tem'r". On November 23, 1768 the Master and Wardens named in Bro'r Hooper's letter took part in the installation of R. W. John Rowe as Grand Master. There also attended Brothers Bulkeley Emerson, Moses Parsons, Moses Titcomb and Rev. Edward Bass. "Masons are hereby notified that the R. W. Stephen Hooper Esq. intends to celebrate the feast of St. John, the Evangelist, on Tues. the 27th of December at Mason's Hall in Newbury-port. All brethren are desired to attend at eleven o'clock A.M. The issue of December 15, 1775 of the same paper carried a notice for the brethren to assemble on December 27th at Messrs. Davenport's at the sign of General Wolf, by order of R. W. Stephen Hooper for the celebration of the Feast of St. John, the Evangelist and was signed by Bulkeley Emerson as secretary. The first records of proceedings of St. John's Lodge start November 7th, 1781 and consists of the "Bye Laws of St. John's Lodge". At the end of the by-laws is this notation. "The above laws, settled and approved of at a General and Public Lodge held at Mason's Hall on the seventh day of November 5781 and A.D. 1781 — Witness the hands of the following officers and Brethren"
On December 27, 1781 the following notation is found: "To celebrate the feast of St. John the Evangelist". The following Brethren were Voted into the several offices in the Lodge set against their respective names for the ensuing year-viz. There were 31 members and three visiting brethren present at this meeting. A study of the records shows that during this period there were approximately 90 members. There is no record where the early petitioners for the charter were made Masons. It is quite probable that all being merchants, army officers and captains they were raised in Boston or Marblehead. The early by-laws provided for the annual meeting to be held on the feast of St. John the Evangelist and the officers chosen before twelve o'clock A. M.; every person made a mason should pay the treasurer for use of the lodge three pounds plus three shillings to the tylers: every brother made a member shall pay twenty-eight shillings; every member shall pay one shilling and four pence every month for the benefit of masonry and one shilling four pence every regular lodge night he is present for expenses; every visiting brother (after the first visit) shall pay three shillings towards the expenses of the lodge; every member shall attend the meeting of the Lodge on regular and general lodges at least once in three months if within the State, and in default thereof shall be summoned before the Lodge where in case of obstinate disobedience to the precept of the lodge or on failure of giving to the lodge satisfactory reasons for such absence, such member shall be expelled from the Lodge as an unworthy Brother; no member of this Lodge shall profanely curse or swear in the Lodge or hold any private council or conversation or absent himself from the lodge whilst the Lodge is open, without leave obtained from the Master under the forfeiture of three shillings for each and every such offence; whenever a special lodge is convened he or they at whose instance the meeting is called shall pay all the expenses; every person proposed and every man made a member shall be vouched for by some member present and if the person made a brother or member does not pay the sums for their making at the same meeting, the sums shall become the debt of the vouchor and he shall be held for the same. Stephen Hooper was born the son of Robert Hooper of Marblehead on July 3, 1741. He graduated from Harvard in 1761. His father was called "King Hooper" and was one of the wealthiest merchants of New England. Stephen operated a mill at the mouth of the Artichoke River, had a shipping business on the wharf above Green Street and resided on the south side of Frog Pond. He died Jan. 16, 1802. Hooper was Master 1766-1780 and 1786-1802. Nathaniel Tracy was without a doubt the most prominent of our early brethren. In a memorial presented to Congress in 1806, ten years after his death, it was claimed that from the beginning of the Revolutionary War until peace was declared in 1783, he was the principal owner of 110 merchant vessels which with their cargoes were valued at $2,733,300. All but 13 were lost or captured. He also owned 24 cruising ships carrying 340 guns and 2800 men. These ships captured 120 vessels carrying 2225 men. The captured vessels and cargoes were sold for $3,950,000. From the sum, Mr. Tracy contributed $167,219 for army supplies. He was selectman of the town 1780 and 1782 and representative to the General Court in 1782. He was Master of St. John's Lodge 1781-1782. He lived in the building now used as the Public Library. John Tracy, Master 1783-1785, a brother of Nathaniel, gave a considerable sum to clothe the Continental Army. He resided on High Street, saw service in the army, lost 41 vessels during the war and was a successful merchant. Michael Hodge was a captain of the Newburyport Artillery Company and was collector of customs of the Port from 1766-1784. Col. Edward Wigglesworth the Junior Warden served with great distinction in the army. He was with Washington at Boston, New York, and Valley Forge, and when retired, he was given thanks by Washington. He was representative from 1792-1795. Laurence Furlong was author of the American Coast Pilot. Nathaniel Knapp was overseer of the poor for many years. He was a man of good sense, honest and upright. He fought in the French and Indian War and the iron shell which now reposes in front of the Court House on the Mall was brought from the siege of Louisburg by Bro. Davis Coates in memory of Bro. Knapp. Rufus King, representative to the General Court, member of the Continental Congress, four times Senator from New York, was twice Minister to the Court of St. James. He was a signer of the Constitution, yet on Dec. 27, 1783 he was fined three shillings for leaving the Lodge room without permission of the Master. Capt. Moses Brown spent 46 years on the sea. He commanded merchant vessels, privateers and the war-ship (so-called) Merrimac built at Newburyport and loaned to the U.S. Government. Eleazer Johnson, captain of one of Stephen Hooper's vessels, the Dalton, was captured by the British and with Brothers Henry Lunt and Samuel Cutler were lodged in Hill Prison at Plymouth from which they escaped. Jonathan Titcomb was a brigadier general, fought in the Revolution, member of the first General Court, member of the State Convention for forming the State Constitution with Bro. Rufus King. Right Rev. Edward Bass, D.D. although not a member of St. John's Lodge was an ardent Mason and visited St. Peter's and St. John's Lodges many times. I call attention to Rev. Bro. Bass because of his close association with the Brethren. The records of both lodges speak in glowing terms of his excellent addresses delivered to the Brethren on the occasion of celebrating a feast day. He was rector of Queen Anne Chapel and St. Paul's Church from April 2, 1756 to Sept. 10, 1803. He was ordained the first Bishop of the Diocese of Massachusetts, New Hampshire and Rhode Island on May 7, 1797 in Philadelphia. I make mention of only a few members in order that you may note that there was hardly one man whose name appears during the earlier period but who was prominent in the affairs of the colonies. So has it been through the years to this very date. We still have members active in government and untold numbers who have defended their country on land, sea and air; yes, even as our brethren of yesteryear, they have given their lives that we may breathe the air of freedom. "Voted that the stewards be and hereby are desired to procure some wine glasses and candlesticks such as they shall think suitable for the Lodge. Also to have the tables mended." "Voted that Bro. Perkins is guilty of a breach of the 11th Article of the Laws for leaving the Lodge whilst open, without Leave having been obtained from the Master, and that he be fined 3 shillings." At every meeting a collection for the distressed brethren was made and a committee appointed to disburse it. There was always a committee appointed to serve as caterers and the)' were thanked for the very excellent repast. The celebrations of the Feast of St. John the Baptist in June and St. John the Evangelist in December were always marked with a banquet and an address. The speaker was either Rev. Edward Bass, Daniel Marquand or Dudley Atkins. The Lodge usually assembled at Thomas Merrill's or William Davenport's. It was voted to give up Masons Hall and meet at Thomas Merrill's; then on October 5, 1785 it was voted to remove the lodge in due form to William Davenport's house till a more convenient room could be obtained. On October 4, 1785 the Lodge met with St. Peter's Lodge to attend the funeral of deceased brother Joseph A. Davis, Tyler of St. Peter's. In 1785 on motion of Bulkeley Emerson and seconded by Bro. Dudley Atkins that from the scarcity of money and the very considerable sums now in arrears from the members of this Lodge, it was voted that each member be earnestly requested to pay one quarter part of his past dues (exclusive of sums due for making) as soon as maybe which shall be in full discharge for the same and that in the future there shall be quarterly payment of ten shillings to the fund by each member and that the expense of every evening shall be equally assessed on the members who shall be present and to be paid before the lodge is closed. In 1788, on returning from a funeral, the Brethren of St. Peter's and St. John's Lodges returned by invitation of our Master to St. John's Lodge rooms where the most dissembled harmony and friendship pervaded the whole and Masonry shone in full favor. From March 17, 1791 until March 30, 1803 there are no records of any meetings. This statement is further subscribed in a record of the Grand Lodge of a letter dated March 11, 1793 which states in part: "that St. John's Lodge, as he is informed, has not met for several years and that the letter and book designated for the Lodge are reserved." March 14, 1803, the following statement in Grand Lodge records appears: "A petition was presented from Michael Hodge and others in Newburyport, surviving officers of St. John's Lodge, chartered by the late M. W. John Rowe, Grand Master, that they may be admitted to assemble as a lodge and promising due submission to the laws and regulations of the Grand Lodge. It was committed to the R. W. Bell, Oliver and Howard, who reported in favor of their admission, also, that their charter should be endorsed and the Lodge take rank from the time of its endorsement." On Sept. 10, 1804 in the list of Lodges published by rank, St. John's of Newburyport July 17, 1766, is fourth on the list. On March 30, 1803 a meeting was held at the lodge rooms with Michael Hodge acting Master. There were 10 brethren present and they admitted 10 brethren as members, remitted all dues owed up to that time and elected officers with Gilman White as Master. The officers were installed by Jonathan Gage, District Deputy Grand Master. They voted "all who were members previous to the endorsement by the present Grand Lodge be solicited to attend the future meetings of this Lodge as honorary members free of dues". For the next five years St. John's prospered, then came the embargo act which forbid our vessels from visiting foreign ports which resulted in the shipping industry practically shutting down. This was followed by the great fire of 1811 and the war of 1812. Nov. 15, 1803: I note the first time members of St. Mark's Lodge visited St. John's. St. Mark's charter was granted Sept. 14, 1803. Nov. 30, 1803. The first communication from the Grand Lodge appears copied in the records, regarding the expulsion of two members of Republican Lodge in Greenfield, also a notice from John Proctor, Grand Sec'y stating that "the seals of lodges must be affixed in appointments of Proxies in the future". March 21, 1804. It was voted "that the tylers of St. Peter's and St. Mark's Lodges for the time being be allowed to visit this lodge free of dues". May 16, 1804 the lodge voted "that no notice be taken of the communication presented this evening from St. Peter's Lodge concurring that, Lodges have no right to dictate to them who they shall receive as visitors". At a meeting later in the month it was voted not to celebrate the festival of St. John as it would conflict with the constitution of St. Mark's Lodge. On Dec. 5, 1816 the District Deputy made his annual visitation to all three lodges the same night. On April 24, 1815 new by-laws were adopted where every member was to pay twenty cents, present or absent at every communication, except those at sea who were to pay ten cents and visitors twenty-five cents. To carry on through the years up to 1916 would be only a repetition of the excellent history, so I will note those happenings which I consider important. During 1823 there was a movement to unite the three lodges, but it was voted down by all three. On March 17, 1825 Caleb Putnam was made a Mason and with this notation "This petition has been on file many months and it is clearly understood he is to pay his initiation fees by serving as tyler of St. John's Lodge, the present incumbent resigning". September 1825 brought the appointment of three brethren to investigate all future applicants. Beginning about 1828 there followed a rough course for Masonry and on Oct. 4, 1834 the lodge voted to return its charter to Grand Lodge and that the secretary be requested to forward and secure a receipt for the same. Until Dec. 14, 1853 St. John's Lodge was non-existent and held no meetings. On the above date, upon petition of Richard S. Spofford and others, the Grand Lodge ordered the restoration of the charter and on December 22, 1853 the organization was completed at the home of Wor. Bro. Spofford. From 1854 until 1909 the following notation is carried on each meeting record, "opened in the name of God and Holy St. John". At the same meeting, it was voted "that a committee of three be chosen to investigate how and which way and by whom two quarts of oil was obtained and charged to the Lodge". October 17, 1861. "No work at hand, being a war among ourselves (U. S. A.) the Lodge closed as usual". January 9, 1873 three brothers from England who were shipwrecked on the steamship Sir Francis off Salisbury beach "who were saved from a watery grave by that Supreme Being who is the Great Architect of all things" visited the Lodge. February 7, 1884 the Permanent Fund started. In the year 1895 the Lodge started the election of all officers by ballot. July 16, 17, 18, 1916 the 150th anniversary was celebrated in full form. During the next few years St. John's had a period of prosperity due to the World War. Many applications were received and membership raised. Meetings were curtailed during February and March due to an epidemic of influenza. Enclosed please find bill for gilding the Historic Pillars standing in the East of the Lodge room. In 1883 I gilded these pillars free of expense to the Lodge. As you have come to me and wanted them reguilded I have done so, also repaired them and put them in good condition for many years in the future. I doubt if it will be my lot to do them again. I now ask that you and your officers as well as the members to accept the enclosed bill receipted in full with my sincere wishes that it will in the future be a most powerful agency for the good of this community. Stock and labor taking down, repairing, gilding and putting up pillars $103.69. Note: No charge to the Lodge. November 11, 1921. Wor. Master announced that there would be a joint meeting of St. John's and St. Mark's Lodge in Masonic Hall November I5, 1921 in honor of George Washington, the Mason, at which time there would be speaking by Rev. Edward A. Chase of Beverly, Grand Chaplain. September 7, 1922. Bro. Francis Noyes presented the Lodge with a poster issued in 1799 in connection with a memorial service in honor of Geo. Washington. March 1, 1923 it was voted to send Dresden Lodge #103 of the State of Maine the sum of $25.00 to help build its Lodge that was destroyed by fire Nov. 25, 1922. October 4, 1923 it was voted to furnish a room in the Williams addition at the Masonic Home at Charlton, such sum not to exceed $350. Examples of the amount of work the Lodge was confronted with are the following notations: 8 applications, 7 elected, 3 passed and 5 entered on one night; 8 elected, 12 applications, 5 entered on another night; 10 elected, 1 rejected, 5 entered and 5 passed was one evening's work. During the period to May 1927 the records are in a way monotonous, the Lodge showed continued prosperity and on May 5, 1927 a committee was appointed to act with St. Mark's and the Temple Club for the purpose of considering the formation of a Masonic Building Association. September 1, 1927 a joint meeting of St. Mark's and St. John's Lodge was held and it was voted to start a campaign to raise funds for a Masonic Temple. June 20, 1928 brought forth the ceremonies of laying the cornerstone of the New Temple located on Green Street. March 27, 1929 a special communication was called for the purpose of dedication of the Masonic Temple. Most Worshipful Herbert W. Dean, Grand Master of Masons in Massachusetts, was received by a committee of all Past Masters of St. John's and St. Mark's Lodges to attend on the Grand Master and other Grand Officers. A catered dinner was served and music provided by the Haverhill Masonic Band. Selections were sung by the Weber Male quartet of Boston. There were no special events again until 1941. The Lodge attended to the business at hand and remained under excellent leadership. June 5, 1941 the Lodge celebrated the 175th anniversary of the issuing of the Charter. A banquet was served with the "Hill Billies" from Concord furnishing the entertainment. Most Worshipful Albert A. Schaefer and Suite were received within the Lodge room by the now R.W. William H. Willis. The records state that the Grand Master gave his address, but as it was extemporaneous it was impossible to record it. The Grand Master was very witty and a most interesting speaker. June 27, 1941. The following is a copy of our records June 27th communication: "Whereas: St. John's Lodge has been honored by the courageous and heroic act of our Bro. Henry Graf in saving five young women from possible drowning in a recent accident on Plum Island Turnpike when the car in which the women were riding left the road and plunged into Plum Island River. It is noted that Bro. Graf, who was driving by at the time, left his machine and at considerable danger for his own life plunged into the river as the car was sinking, he released the car door and helped the women to safety, thus preventing a fatal tragedy. Resolved: that this record express the sincere commendation of his Lodge and a copy be sent to the Grand Lodge." Jan. 1, 1942. The Lodge was presented a Henry Price Medal which had been the property of Most Worshipful Charles Chase Dame and given to the Lodge by Charles C. Dame of Beverly. September 2, 1948 Bro. Arthur P. Marden was honored on the completion of 46 years as organist. From the years 1941 to 1948 the Lodge was very active having worked 103 candidates. November 22, 1948. At the request of Grand Lodge, St. John's conferred the degrees on Robert Wilder Perkins for Pearl River Lodge #109, Canton, China. When the degrees were completed, it was found that Pearl River Lodge #109 had gone underground, therefore, the Grand Master of Massachusetts, Most Worshipful Roger Keith declared him to be a member of this Lodge and had him sign the by-laws. May 5, 1955 it was voted to give a sum of money as a gift to the new Emeth Lodge constituted in this Temple April 25, 1955. June 28, 1955. Funeral Services were held for our departed brother, R.W. Willard Stone Little. He was the 995th member to sign the by-laws and a Mason of outstanding virtue. April 5, 19S6. This was indeed an outstanding evening for St. John's Lodge. R. W. Perley E. Miller, Jr., Grand Warden, was received within the Lodge and he informed the Master that he had a most pleasant duty to perform. By direction of the Grand Master, Most Worshipful Whitfield W. Johnson, and in the absence of R. W. Frank Hargraves, D. D. G. M., who was ill, he was directed to present Rev. Bro. Harry Grimes the Distinguished Service Medal for his outstanding service to Masonry and St. John's Lodge. Rev. Bro. Grimes had served this Lodge faithfully as Chaplain for more than a quarter of a century. The remainder of the meeting was declared Rev. Bro. Harry Grimes' night and a program followed. He received a Chaplain's apron with the names of all Masters he had served under. Rev. Bro. Grimes passed away December 5, 1959. May 26, 1964. Wor. Frederick A. Perkins passed away. He was our oldest past Master, having been born Feb. 15, 1868. Until a few years before his death he was always called upon to give the candidates a charge and he gave it as only Fred could do it. It was truly amazing that a man of his age could memorize such a lengthy and beautiful lecture. May 23, 1965 a Special Communication was held in the Masonic Temple to attend Sunday services at The First Church of Newbury. The lines for the parade were formed in front of the Temple at 10:10 A.M. with the Newburyport Commandery as an honor guard. 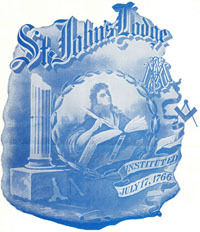 St. John's, St. Mark's and Emeth Lodges formed the Blue Lodges. The Commandery was preceded by the Portland Maine Commandery Band. The Blue Lodges were preceded by the Bektash Temple Band. Next in line was the Order of Rainbow for Girls and the DeMoIay. They were preceded by the Blue Bell Girls Band (all members of this band are Rainbow Girls). The Grand Master of Massachusetts led the parade and reviewed it at the entrance to Newbury. The Grand Master of New Hamshire marched with the Blue Lodges. Coffee and doughnuts were served before the march and a smorgasbord was served after the services at the Temple. There were 526 Masons in the parade. These are only a few of the outstanding events that have taken place during the last 200 years. St. John's is still very active and trying to carry on in the tradition handed down to us from our predecessors. With the help of God and our own endeavors, St. John's Lodge will prosper and make history for the next century to record. How good and how pleasant it is for brethren to dwell together in unity. Officers in St. John's Lodge, Newburyport. R. W. Jonathan G. Johnson, Master. W. Stephen Folsom, S. W.
W. Nathan Chase, J. W.
R. W. Thomas B. White, Master. Wor. Joseph Bartlett, S. Warden. Wor. 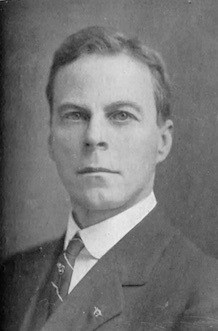 Moses Merrill, J. Warden. Bro. William C. Williams, Secretary. Bro. Isaac Johnson, S. Deacon. Bro. Benjamin L. Atkinson, J. Deacon. Bro. Wm. Collins, J. Steward. The late Anniversary of St. John the Baptist was more generally celebrated in the Fraternity, in various sections of the country, than for many years past. In this respect, our Brethren in Newburyport are everywhere conceded to have excelled their competitors. With them and their fellow-citizens of all classes it was a holiday. The town was beautifully and elaborately decorated with flags, banners, and bunting of every conceivable description, and the whole people seemed to have entered into a competition to determine who should make the most attractive and beautiful display. The procession, which was both large and brilliant, marched through the principal streets of the city, and was everywhere received with acclamations. One of the most interesting features in it was the large number of aged Brethren who honored the occasion with their presence. Among them was Gen. Josiah Whittaker of Providence, who, although upwards of eighty years of age, and silvered o'er with time's relentless hand, is, to-day, as straight and more sprightly than many a younger man; in fact, he almost seems, if one could forget his white locks, to be but in his prime. Gen. Whittaker was initiated into the secrets of Masonry in 1812, and in 1814 was knighted. At the laying of the corner-stone of Bunker Hill Monument, in 1825, he commanded the Sir Knights who did the honors in that occasion, and now, although forty-four years have elapsed since that memorable event, he is still hale and hearty, and has the promise of future years of usefulness. In a carriage in the procession were Sir Knights John Ackerman of Newburyport, 73 years of age, and who had been a Mason for fifty years, and had passed through all the grades; Abner Kenniston of Newburyport, eighty-five years old, and for fifty years connected with Freemasonry. At the conclusion of the public parade the company repaired to a large tent, erected for the purpose, for dinner, where they spent an hour of pleasant enjoyment, after which the procession was again formed and proceeded to the Pleasant Street Church, where an eloquent and able oration was delivered by the M. E. Sir Knight, B. B. French, of Washington City, which we hope, hereafter, to lay before our readers. In the evening, the festivities of the day were appropriately closed by a promenade concert and ball, in a spacious tent appropriately fitted up and decorated for the purpose. St. John's Lodge of F. and A. Masons, of Newburyport, Mass., was visited officially by District Deputy Grand Master Herbert C. Taft, of Georgetown and suite on the evening of October 2d. The Weber quartet rendered choice selections, and the work of the Lodge was highly complimented. A banquet was served, at which speeches were made by Mayor E. P. Dodge, Rev. B. D. Sinclair, W. Harriman, W. Scott Symons, and Rev. O. S. Butler, of Georgetown; G. M. Homans, of Gloucester; P. G. M. Charles C. Dame; ex-Mayor Parsons, of Gloucester; and others. It is said to have been one of the largest and most successful gatherings in the history of the Lodge. Among notable Masonic events that have attracted attention in Massachusetts during the past year, perhaps none have roused deeper interest than the observance of the 150th birthday of St. John's Lodge, Newburyport. Only three other lodges in the state outrank it in age,— St. John's and St. Andrew's of Boston and Philanthropic of Marblehead. The Newburyport celebration was in three parts, a church service on Sunday, July 16, Historical exercise on Monday, July 17 with a banquet in the evening and a Ladies' Night on Tuesday evening with a banquet at City Hall. The church service was held in the historic Old South Presbyterian Church. The Lodge was opened at 2 o'clock. A procession was formed and proceeded to the church. Nearly 500 members of the fraternity including Rt. Wor. Bro. Benjamin B. Gilman of Haverhill, District Deputy Grand Master of the 10th Masonic District, St. Mark's Lodge, and representatives of other lodges, participated in the occasion. Members of their families and many of their friends also enjoyed the church exercises. The large concourse of people was inspiring. Palms and potted plants and flowers in full bloom were tastefully arranged in front of the high pulpit, accentuating the classic beauty of the architecture and interior decoration. A hearty welcome was extended by Worshipful Master Oscar H. Nelson. Music was provided by a quartet. The sermon was by William H. Rider, D. D., a member of the Grand Lodge. Dr. Rider's topic was "Masonry: Its Genius." His text was from Matt. 3:3, "Make His Paths Straight." The interesting sermon held the close attention of the large audience. We have space for a few closing paragraphs. "Masonry's real concern is the fostering of such motives as shall develop a larger life in and for all. It would wake a man up to his God-given growth, give him hope, let him feel the heart beats of his fellows co-operating with him in the upbuilding of a finer selfhood, an immortal character. "Its ritual teaching insists on the worth, not the superficial value of a man, just a man in his manhood, naked of his wordly wealth or outward environment. "Next to one's trust in God, Masonry, Americanism, religion, will only be content with a love for humanity. "Today as a hundred and fifty years ago our country, this age, has need of this American, this Masonic motive for genius of brotherhood wide as humanity until without loving America as our local brothers less we can say, 'The world is my country to do good my religion.' Scramble! scramble! cries society. Get what you can! Safety first! Talk peace, but sell all the munitions of war you can! The end justifies the means! What is international law when it blocks the way? A scrap of paper; malice, cruelty, sway this world. These are the sibboleths that betray the Shiboluth that passes its love to God and man. "May I ask how you can shoot fraternity into men, push with the bayonet humanity into the heart, coerce people of varying traditions by the damning force of war into good will ? Are the beastlike minds of the powers unmindful that any justice can prevail? Still it is Thor's Day! God is still God, and His faith shall not fail us. "He is not on the side of the greatest battalions. When those have done their murdering work and the bugles call retreat, then, as after our own fratricidal strife, without drum, without cannon, with the Lincoln spirit of malice toward none, charity for all, we can only win. "Just as in our American humanity, with her Red Cross nurses, her corps of surgeons, her food and clothing; for the heroic Belgians, American reaches the Angels' song, 'Peace on earth, good will among men.' Such contention shall change this hell of war into a world-wide nationless democracy. A united Europe, man the king, come he from royal house or peasant's cottage." The historic exercises began on Monday in Masonic Hall at 2 o'clock Grand Master Melvin M. Johnson and other members of the Grand Lodge were introduced to the lodge by a committee of which R. W. Green Davis was chairman. They were received with the honors due their stations. Worshipful Master Oscar H. Nelson extended a cordial welcome. A procession was then formed and proceeded to the Old South Presbyterian Church where the exercise-were conducted. Organist James M Hill presided at the organ during th arrival and when the lodge entered played Boston Commandery March. Worshipful Master Nelson spoke briefly and extending a hearty welcome stated "that St. John's Lodge is proud of its age, and of its sister lodge, St. Mark's, now 113 years old; and especially proud because of its connection with the Grand Lodge, which is the oldest in the country." Grand Master Johnson delivered an eloquent address. He brought the congratulations of the Grand Lodge and its hopes and expectations. He then spoke on Masonry as a philosophy, requiring belief in God, and giving members the right to worship Him, as they wish, the right of free thought. Masons do not owe any allegiance to tyrants. The development of friendship and brotherly love is the prime principle. One can hardly stand in this place without referring to this building, its associations and surroundings. His memory hallows the ancient town. The bell in the steeple was cast by our illustrious brother, Paul Revere. In the house next behind this building was born William Lloyd Garrison, the apostle of liberty. This building antedates St. John's Lodge by some ten years. In it, both in the past and now, many of our brothers came and come to worship. Most fittingly do we here gather to celebrate this anniversary of the dawn of Masonry in this community, where Masonry has always been particularly prominent. Almost from the beginning of the town as a separate municipality many of her leading and substantial citizens leaving outside religious prejudice and political differencw, have, in the Masonic bodies, met in social converse, inculcated the doctrines of the fatherhood of God and the brotherhood of men, and practiced charity. Citizens of Newbury were made Masons in the lodges in Boston as early as 1740 and thereabouts. The history of the lodge naturally divides into three periods; the first ending and the second beginning with the endorsement of the charter in 1803; the third, from the reorganization of 1853. The charter names only Stephen Hooper, whom it appointed to be the first master. He was a son of Robert Hooper or 'King Hooper,' as he was called, of Marblehead one of the wealthiest merchants of New England. Stephen was a graduate of Harvard college; born in 1741. He was in his 26th year. Very likely he was made a Mason in the lodge at Marblehead. The charter does not give any name to the lodge, but authorizes the 'forming' of the brethren into a regular lodge. When the name 'St. John's' was first adopted does not appear. The lodge was first registered in St. John's Grand Lodge, as Newbury Lodge, October 21, 1766, and in all the records of that Grand Lodge, down to 1792, is called either Newbury Lodge or the Lodge at Newburyport. But it is described as St. John's Lodge in the published notice of the feast of St. John, in December, 1774. In 1768, at the elaborate ceremonies attending the installation of Right Worshipful John Rowe as Grand Master, the Newburyport Lodge was the only one in the procession outside of the Boston lodges. June 24, 1779, Bishop Bass delivered an address before the lodge at St. Paul's Church, on the character of the beloved disciple. At that time Nathaniel Tracy is addressed as Master, and George Jenkins and John Tracy as Wardens. It appears therefore, that notwithstanding the strenuous time and the fact that practically every man whose name we have been able to find as belonging to St. John's Lodge before or at the beginning of the written record, was engaged in the war, directly or indirectly, St. John's Lodge kept up its meetings during the Revolutionary War. Where the lodge met in its earliest days is not known; very likely, as was the custom, at Mr. Davenport's (the Wolfe Tavern); or at some other tavern. But in 1772 a room for lodge meetings had been provided in Temple Street and was called Masons' Hall. I have been told that traces of Masonic emblems may still be discerned upon the walls. Here St. John's Lodge met in 1774 and '75. The written record begins with the by-laws settled and approved at a general and public lodge held at Masons' Hall, November 7, 1781. These by-laws were signed by 37 persons, 21 signed later, and some 18 or more did not sign at all. I consider that these 76 different persons were members during this period, and I have sufficient names under suspicion to warrant the statement that the number of such persons was very nearly in the vicinity of 90. These by-laws provide for the annual meeting on the feast of St. John the Evangelist before 12 a. m. The fees for making candidates were three pounds, plus three shillings for the tylers. In accordance with these by-laws the first recorded annual meeting was held the 27th of December, 1781, with 28 members and three visitors present. The same list of officers was elected, with the exception of the stewards. January 30, 1782, the Right Worshipful master presented the lodge with an elegant set of jewels. The Senior Warden presented a genteel lock for the door. This lock is now in the armory of the Newbury-port Commandery. The feast of St. John the Baptist was held at Widow Bailey's tavern, Newbury, new town, and there was a collection for the benefit of poor Masons. It appears to have been thy custom at the feasts to make such collections. Not infrequently on the feast days the lodges attended church and listened to discourses from the ministers of the town. The style of living at this time (after the war) is to be remarked. "The town never presented so gay an appearance as it did for 25 years after the peace of 1783," says the historian of Newburyport. "Every family of any pretension kept their family carriage, footman and coachman, and ladies their own saddle horses. The deep wine-cellars under some of the old mansions, broadly hint of the stores of Port and Burgundy which once filled their now dreary depths, while vessel after vessel, arriving direct with rich silks, velvets and laces from France, enabled our grandmothers to appear in costumes which would awaken the envy of many modern belle." Teachers of dancing, the broadsword exercise, etc., advertised in the papers, "while the frequent festivals held among the Masonic fraternity and other bodies evinced a determination to enjoy life." Some remarks here and there may tend to create the impression that our ancient brethren were not so temperate as is becoming. A record he and there that the day was celebrated with 'decency and decorum' may, to some, imply that there were occasions of which that could not be said. Here is the reckoning or bill for entertainment of St. Peter's Lodge the feast of St. John the Evangelist at Deer Island in 1782. When we consider that these were the days when towns appropriated Money for grog for soldiers' widows and the mug of flip was set to heat whenever the minister was seen coming, and even ordination in the churches were not concluded with an anthem and a glass of cold water, such a predominance of liquids in the entertainment is not to be wondered at. "I make brief mention of these few. There is hardly a name upon the list during this first period but what was that of a man of public spirit, enterprise and high character. They were such men as these who in the town meeting of May 31, 1776, voted, without a dissenting voice. 'That if the honorable Congress should, for the safety of the United colonies, declare them independent of the kingdom of Great Britain, this town will, with their lives and fortunes, support them in the measures,' and in their action came fully up to the promise of their words. From 1769 to 1792 there had been two rival grand lodges in Boston. In March of that year their union was accomplished and the Grand Lodge of Massachusetts formed. Bring a hake from the Shoals. In 1810, on its repeal, there was a lifting of the storm, but then came the great fire of 1811, burning over 16 1/2 acres of the most compact part of the town, and the war of 1812. There is no record on our books of any meeting from February 6, 1808, to December, 1814, when a committee was appointed to apologize to the Grand Lodge for not paying its clues for several years past. From the records of St. Peter's Lodge it appears, April 4th, 1814, that during the six years previous the charges to St. John's Lodge for fuel in the winter months, were but for six meetings in the six years. Beginning with December, 1814, however, the records show frequent and regular meetings. In January, 1815, the book records 28 members. New by-laws were adopted in April, 1815. Every member was to pay twenty cents, present or absent, at every communication, except those at sea, ten cents, visitors twenty-five cents. It was provided that in case there should be but one negative ballot, the master should notify the brethren that the executive committee would be in session for fifteen minutes; that it should be the duty of the brother who cast the negative to meet them and state his reasons. If the report was favorable the candidate should be received as if there had been no negative. Under these by-laws John Scott, attorney at law, received one negative. William Bartlett, Jr., objected because Scott had sued him. The objection being not founded on reason Scott was initiated. The beginnings of the temperance movement are here. All refreshment was to be intermediate and none allowed after the lodge closed. During several following years different votes were passed in favor of or against refreshments. In June, 1825, St. Mark's and St. John's united in hiring the third story of the Phenix Building and two rooms below. July 21st the new hall was open for public inspection, at a joint meeting of the lodges. The Newburyport Herald of the next day speaks of the beauty and taste of its plan, the splendor of its decoration, as equalled by very few works of the kind in the country. A writer to the Herald speaks of it as most elegant and superb; as magnificent in design, brilliant and imposing in effect, and as likely to be a principal place of attraction to those who travel. November 23d, 1825, a committee was authorized in connection with the committee of St. Mark's, to erect two brazen pillars. April 19th, 1826, resolutions of appreciation of Dr. Spofford's exertions in procuring the pillars were adopted and the lodge agreed to pay $75 towards their cost. These pillars are now standing in St. John's Lodge, where they are notable objects of interest. They are said to have cost Dr. Spofford about $500. They are fine examples of the old wood carving which used to flourish here in the days when figureheads and carved work for vessels were in demand. They were dedicated April 24th, 1826, the officers of the other Masonic bodies and about 300 ladies being present. December 21st, 1825, the Rev. John Adams was made a Mason. The record says, 'Of course, no fee was received.' This brother was 'Reformation John' Adams, pioneer of the Methodists in Newburyport. In the early part of 1826 there were movements towards the uniting of St. John's and St. Peter's as one lodge and for a union of all three lodges. St. John's was not favorable to these proposals. July 4, 1826, the lodge joined in the celebration of the fiftieth anniversary of the signing of the Declaration of Independence. There was a procession commanded by Major and Brother Caleb Cushing of St. John's, in which many organizations marched, including the five Masonic bodies of the town. The noble and aged veteran and brother, Col. Edward Wigglesworth, then 85 years of age, rode in an open barouche, drawn by white horses. There were exercises at the Pleasant Street Church, music by an orchestra led by Thomas White, then Master of St. John's, a hymn by Hannah Gould, set to music by worshipful Brother White was executed with great effect, an oration followed by a dinner. So ended the second period of the history of St. John's, during which time it held some 300 meetings. One hundred and sixty-six were mad Masons and 169 others became members. There was never any anti-Masonic party in Newburyport and it is said that there were some curious stories about the dismemberment of the fraternity here, but I have been unable to trace them. The violence and bitterness of the anti-Masonic sentiment in the country at that time can hardly be realized now. The fearful excitement swept over the land like a moral pestilence, entered and divided churches, sundered the nearest of social ties, and set members of families against each other. Some Grand Lodges suspended for years. In New York the number of lodges went down from 308 in 1820 to 65 in 1832. In Vermont laws were passed hostile to Masonry and not a lodge survived. December 14th, 1853, upon petition of Richard S. Spofford and seven other members of St. John's Lodge, the Grand Lodge ordered the restoration of the charter and the third period of the history of St. John's began. A meeting for organization December 22, 1853, was held at the house of Dr. Spofford. There were present six persons. The old by-laws were adopted and ten persons admitted members. Irving P. Seavey was elected Master; John Bickford, Senior Warden; William D. Foster, Junior Warden; Mark Symonds, treasurer; Moses H. Fowler, secretary. December 26th, at the same place, the officers were installed by Right Worshipful Past Master John Andrews. December 31st the lodge began its meetings at Odd Fellows Hall, over the Merchants' bank, which was their place of meeting till April 23, 1855. During the first year of its reorganization, the lodge made thirty-seven Masons and admitted fifty-seven others as members, among the more notable being Richard S. Spofford, Jr., the eminent lawyer whom many here knew; Ben. Perley Poore of Indian Hill; Joshua Coffin, the historian of Newbury. BThe next day was celebrated by a grand reception by the city to the sons of Newburyport resident abroad. In the grand procession the Masonic lodges were to have constituted the Bh division, with other societies, but the Masons and most of the others were conspicuously and prudently absent, the thermometer standing at 100 in the shade. In the same month the lodge joined with the lodges of Lawrence, Haverhill and Amesbury in an excursion to the Shoals. In April, 1855, Moses H. Fowler was chosen master, and was installed at Phenix Hall, which had again become the meeting place of St. John's Lodge. December 19th, Dr. Spofford, Robert Robinson and I. P. Seavey were chosen trustees of the hall. I take this to be the original of the permanent trustees of St. John's Lodge. December 21st they were authorized to change the east to the other end. Thirty-two were made Masons, among them N. N. Withington and Captain William Morgan. The latter in January, 1856, was unanimously chosen an honorary member, perhaps on account of his name. September 17th, the lodge assisted at the dedication of the Franklin statue in front of the City Hall in Boston, and, wonderful to relate, the Newburyport railroad carried the members free. June 17, 1857, the lodge attended the celebration on Bunker Hill day and the unveiling of the statue of General and Brother Joseph Warren, and listened to the oration of Edward Everett. On St. John's day there was a celebration at Nashua, with an eloquent oration by Rev. William P. Alger, 700 sitting down to dinner. Some 57 members of St. John's Lodge served their country on land or sea during the war, including one colonel, Eben F. Stone; one major, Ben. Perley Poore, and five captains, one of whom, Luther Dame, is now the oldest living member of this lodge. The year 1866 was the centennial year of the lodge. A modest celebration was held July 17 at the hall. The officers of St. Mark's, the Chapter, and Commandery, past high priests and past commanders were invited and there was a particular invitation to old Masons of the lodge. 'Auld Lang Syne,' was sung, the charter read by the master, the chairs surrendered to former officers, remarks by divers of the brethren and former officers, and a bountiful repast. Of the 42 whose names are recorded as present, William H. Bayley, Charles L. Perkins and Luther Dame are now living. The lodge then had 199 members. In the year 1869 occurred the greatest Masonic event that ever took place in Newburyport. St. Mark's and St. John's united in inviting Lodges, Chapters and Commanderies in Massachusetts, Maine and New Hampshire to attend. On that day a procession was formed on the Mall; Capt. Luther Dame, chief marshal. Some 2,000 were in line. Masonic bodies attended from Springfield, Haverhill, Lawrence, Fitchburg, Gloucester, Danvers, Amesbury, Beverly, Marblehead and Portsmouth. St. John's Lodge turned out 110. There was a review by the grand officers. At the house of Dr. Spofford, then well advanced in years, the doctor appeared in the regalia of the 33°, which honor he had borne for more than 40 years. Dinner was in a large pavilion. There were five tables, each the length of the pavilion, 100 feet. One hundred vases of flowers were used. Four central pillars were decorated with Masonic emblems and mottoes. On each of the 55 poles at the sides hung shields containing the names of the states, Masonic emblems and devices. It was illuminated by 126 gas burners. There was an adjournment to the Pleasant Street church and an address by Benjamin Brown French. Afterwards a levee, well attended to a late hour. The Herald of June 26th says that St. John's day lasted till Friday at Indian hill, Maj. Poore having lost his almanac and reckoning. The major had 154 guests before whom were spread all the luxuries of the season and enough to feed all the men he commanded in the war. Mystic ceremonies were held in the lodge in the grove on the hill. In October, '73, a committee was appointed on quarters for the lodge and a committee to procure funds to repair the pillar. It will be seen by this that there was then but one pillar. I had it from Worshipful Brother Fowler that soon after the reorganization of 1853 he set out to find the pillars which had formerly stood in the lodge and that he found the one which stands at the right of the Master in the possession of John Locke of Seabrook, a second-hand dealer, and had it set up in the lodge room where it stood alone until sometime in the year 1875. I had it from Worshipful Brother Nathaniel Tilton that the pillar at the left of the master was found after the death of Job Burrill, the painter, sawed in three pieces and set up in the garden of Mr. Burrill's house on Winter Street painted in red and used to set flower pots on. The lily-work and ornaments about the capital were much broken and injured. The column was repaired by Brother Joseph W. Evans and after being bronzed was set up in the lodge again in this year, 1875, with its companion, from which it had been so long separated. Being settled in its new quarters, which have now been the meeting place of the lodge for more than 40 years, the lodge provided that its permanent trustees should hold for life and in them should be the title to all the property of the lodge and in their names should all contracts and writings be made. The lodge further proceeded to improve itself in Masonry by procuring the attendance of the Grand Lecturer and exemplifying the work at length. 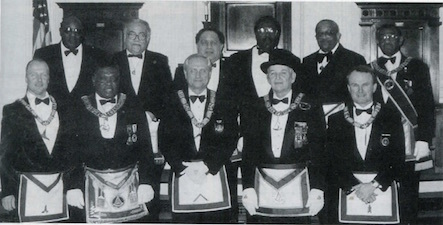 In August, '88, a committee was appointed to procure pictures of all Past Masters and members. Their success in that direction was not remarkable. It was an undertaking of some magnitude, in fact impossible, and seems to have been quietly and efficiently abandoned. In looking back upon the recent years of St. John's Lodge and turning the pages of their record I am impressed with the smoothness and easy groove in which events have been running. There have been changes. The keeping of the feasts by feasting is less noticeable than in former times. The last occasion of that sort of which I have record is when the Lodge celebrated St. John's Day at the Wolfe Tavern in 1888. More and quite frequently, the lodge has attended religious service on the Sunday nearest St. John's Day. The times have not been such as to bring Bndividuals into prominence or into Buch prominence as in former times. Brie feels the character of the membership has not been unworthy of the history and traditions of the lodge while but few of our members have from perspective of the present, been of such prominence in the world as were many of former times, as a rule but few have been other than such as the Master could not address as just and upright Masons. The record of these latter years is, in a way, monotonous, but it is the monotony of prosperity. The lodge has gone on from prosperity to prosperity, increasing in numbers and influence. Today she has the largest membership in her history. The work is being done well and thoroughly, under very competent officers and no cloud appears in sight before her. The banquet following the historical address was served in City Hall. The auditorium had been admirably decorated for the occasion, the entire ceiling being concealed by bunting representing the starry decked heaven, with blue and white bunting at the stage and side walls. Electric lights were arranged so that the illumination was perfect. At the head tables on the stage were Oscar H. Nelson, Master of St. John's Lodge; Melvin M. Johnson, Grand Master; Rev. Dr. William H. Rider, Frederick W. Hamilton, D. D., L.L. D., William M. Belcher, Roscoe E. Learned, William M. Farrington, Arthur A. Sondheim, Theodore L. Kelley, George H. Dale of the Grand Lodge, M. Perry Sargent of Amesbury, Charles W. Perry, Jr., Master of St. Mark's Lodge, James W. Clark, Master of Warren Lodge of Amesbury; Albert P. Wadleigh, Master of Bethany Lodge, Merrimac; John K. Jones, Master, Temple Lodge, East Boston; Warren Brown of Hampton, N. H.; Frederick H. Tarr of the Governor's Council; Moody Kimball, chairman of the Essex county commissioners; Louis A. Rogers, Past Master of Ashler Lodge, Rockport; Albert J. Hatfield, master of C. C. Dame Lodge, Georgetown; William H. Lynds of Lowell; Walter C. King of Gloucester; Charles M. Stacy, Green Davis, William C. Coffin, William R. Johnson, Horace I. Bartlett, Fred H. Morse, Eugene L. Holton, Charles F. Johnson, C. W. Dame, Past Masters of St. John's Lodge. A large number of brethren were seated at the other tables. While the banquet was proceeding excellent music was rendered by an orchestra. At an appropriate moment the orchestra played the Star Spangled Banner, and all present arose and sang the stirring song. As they sang, Past Master Holton pushed a lever that turned the electric current into lamps forming "Old Glory," which had been placed over the stage, and the beautiful electric American flag was displayed. Again he pushed a switch and an electric square and compass, symbolic of Freemasonry, that had been placed just below the flag, flashed forth. The effect was inspiring. Worshipful Master Nelson called for order at the close of the banquet, and introduced a number of speakers. The first speaker was Rt. Wor. Frederick W. Hamilton, grand secretary, who congratulated the lodge on its glorious past and the indications of present prosperity. He called attention to the fact that there are only three lodges in this jurisdiction that antedate St. John's, and then spoke on the principles of Masonry, naming specifically four: The service of God, liberty under law, doing of one's duty and the cement of brotherly love and affection that binds all together. Rt. Wor. B. B. Gilman, D. D. G. M., of the 10th Masonic District, gave an address, in which he called attention to the need of supporting the Masonic home at Charlton. Grand Master Melvin Maynard Johnson spoke of the marvellous history of the fraternity, of the grea* men who had been affiliated with it, and referred to the emphasis that is placed on its charitable work. He closed by presenting Henry Price medals of honor to several members of the craft who have been members of the fraternity for more than 50 years, as follows: Samson Levy, made a Mason in 1858; William H. Bayley, 1858; Charles L. Perkins 1858; Rev. T. James Macfaddin, 1864; of St. John's Lodge; George W. Austin, 1859; and Francis E. Coffin, 1862 of St. Mark's Lodge, and John W. Talbot, 1864, of King Solomon's Lodge, Somerville. The grand master took from his own breast the Henry Price medal that he had worn and pinned it on the breast of Mr. Levy and also pinned medals on the breasts of the other men. Mr. Talbot made a brief speech in which he returned thanks on behalf of his associates and himself. Other speakers were Wor. Master Charles W. Perry, Jr., of St. Mark's Lodge; Mayor Clarence J. Fogg, a past master of St. Mark's Lodge; Past Grand Warden Oliver A. Roberts, former member of three of the Masonic bodies of Newburyport and Rev. Dr. Rider. America was sung and the banquet was at an end. Pictured: Wor. William H. Willis: and M. W. Edgar W. Darling, Grand Master. The 225th Anniversary of St. John's Lodge, Newburyport was celebrated on July 20. St. John's is the fourth oldest Lodge under the jurisdiction of the Grand Lodge of Massachusetts, having been instituted on July 17, 1766. It was a sweltering Saturday in the "Clipper City," and the excitement in the celebration was as high as the temperature. The Lodge was opened by Wor. Stephen L. Dubois, Master. A select committee of Past Masters escorted M. W. Edgar W. Darling, Grand Master of Masons in Massachusetts and his distinguished suite. 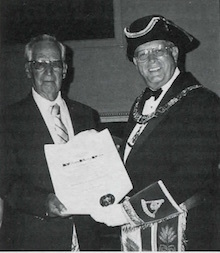 During the celebration, the Grand Master presented a 50-Year Past Master Certificate to Wor. William H. Willis. Wor. Bro. Willis is 90 years old and the senior Past Master of St. John's Lodge. After appropriate remarks by the Grand Master, he closed St. John's Lodge in ample form and refreshments were served in the banquet hall. The celebration continued at the Amesbury Playhouse with a fine chicken dinner and the presentation of Fiddler of the Roof. The day was enjoyed by all. We look forward to July 16, 2016, the 250th Anniversary of St. John's Lodge of Newburyport. St. John's Lodge In Newburyport welcomed several Prince Hall Masons at its February meeting. M. W. Chester Isles, Past Grand Master of the Prince Hall Grand Lodge of Massachusetts, and other Prince Hall Masons addressed the Brethren of the Newburyport 10th District on the history and work of Prince Hall Masonry. St. John's Lodge and Newburyport 10th District Masons visited Castle Hill Lodge in Dorchester in May when Brethren from the Baltimore Lodge, organized by M. W. Prince Hall in the late 1700s, attended from Maryland. Front row: Wor. George Allen. Senior Warden; M. W. Chester Isles; Wor. William Sohni, Master, St. John's Lodge; R. W. Merton Chute. D. D. G. M. Newburyport 10th District; Brother Mark Davidson, Junior Warden. Second row: Wor. Nathaniel Halloway. Past Master of Triple 8 Travelers Lodge in Portsmouth. NH: R. W. Raymond Coleman. Grand Historian; R. W. Glenn Payne. Grand Lecturer; Bro. Frank Robinson; Wor. Bobby Goodwin. Secretary, Triple-8 Travelers Lodge, and R. W. Wilbur Evans. Grand Marshal. This page was last modified on 8 May 2017, at 08:52.